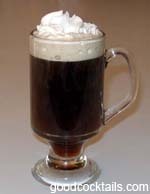 Pour the Irish whiskey into an Irish coffee mug. Fill it with coffee. Add whipped cream on top. You could add Creme de Menthe if you like.